In our ever busy days, eating and drinking something nutritious may not be on our top priority. Constraint of time and energy is probably one of the top reasons why we eat so much fast food and processed/frozen food and drinks. Even an extra step of transferring food onto a plate or washing the dishes become a painful chore, let alone cooking from scratch. The food industry has caught on to this and now they offer healthier versions of packaged foods and drinks, boasting that they are healthy with labels like "zero calorie," "low fat," "no MSG," etc. Just remember that as much as you think they are healthy, they can't be as healthy as they are fresh. Early in the morning, increase our well being and boost our immune system by getting rid of toxins from our body with fresh Wheatgrass Juice. It's rich in chlorophyll, a pigment that helps to detoxify our body, treats bad breath, and has antioxidant and anti-inflammatory properties that help fight infections. 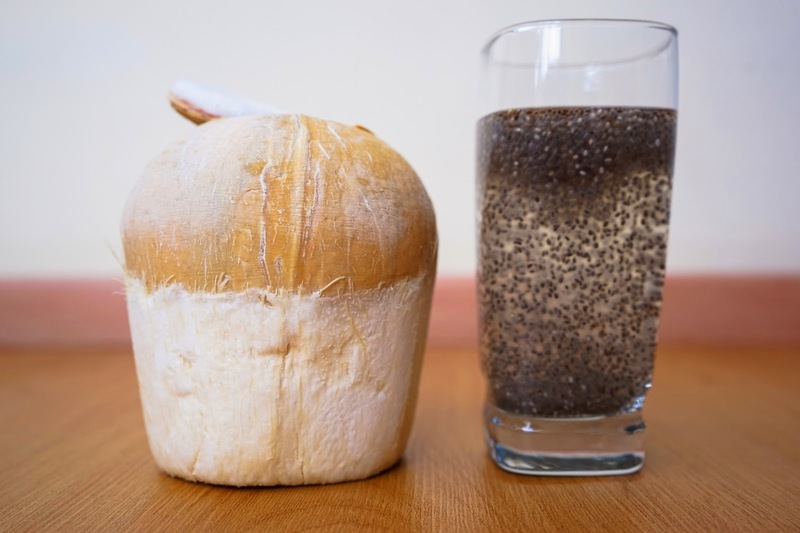 To boost energy and keep you hydrated, try this Coconut-Chia Energy Drink that is packed with protein, fiber, antioxidants, and electrolytes. For those who are on gluten-free diet and allergic to cow's milk but needs an extra dose of calcium, vitamin E, and minerals such as magnesium, potassium, zinc, and iron, try making homemade Almond Milk. This can keep in the fridge for up to five days, so you can make it ahead of time on your less busy days. A healthy gut is one of the cornerstones for a healthy body. Our body needs more probiotics (good bacteria) more than ever before because of all the processed food and drinks we consume and the overuse of antibiotics. This easy to make Water Kefir and Milk Kefir are natural probiotic beverages that can help you balance your gut flora and improve your digestion. It takes only a few minutes to put together, let them ferment for a day or two, and you can enjoy this probiotic-rich drinks anytime at home. Make one big batch and you are set for the week. Throughout the day, keep a big bottle of Fruits and Herbs-Infused Flavored Water to keep you motivated to drink and your body hydrated, while reaping the benefits of the vitamins and minerals that are infused into your water from the fresh fruits and herbs. When you don't feel well or down with a flu, warm your body with homemade Lemon, Garlic, Ginger, and Honey Tea. Each ingredient provides unique power to fight off infections, balances the body's pH and, speeds up circulation, and boosts our immune system.